Just over a month ago, nearly all of the Franklin Central Supervisory Union’s more than six hundred employees gathered at the Collins Perley Sports and Fitness Center. The stated objective of the day was that all faculty and staff would have a greater understanding of the needs of the district’s LGBTQA+ students and would have some concrete ways to create a welcoming environment. LGBTQA+ stands for Lesbian, Gay, Bisexual, Transgender, Queer, Questioning, Asexual, and all of the other variants of gender and sexuality that we understand today. According to the 2015 Vermont Youth Risk Behavior Survey, lesbian, gay, and bisexual youth are far more likely than heterosexual youth to be bullied (40% versus 16%), to experience depression (60% versus 21%), to harm themselves (56% versus 14%), and to make a plan to commit suicide (40% versus 10%). 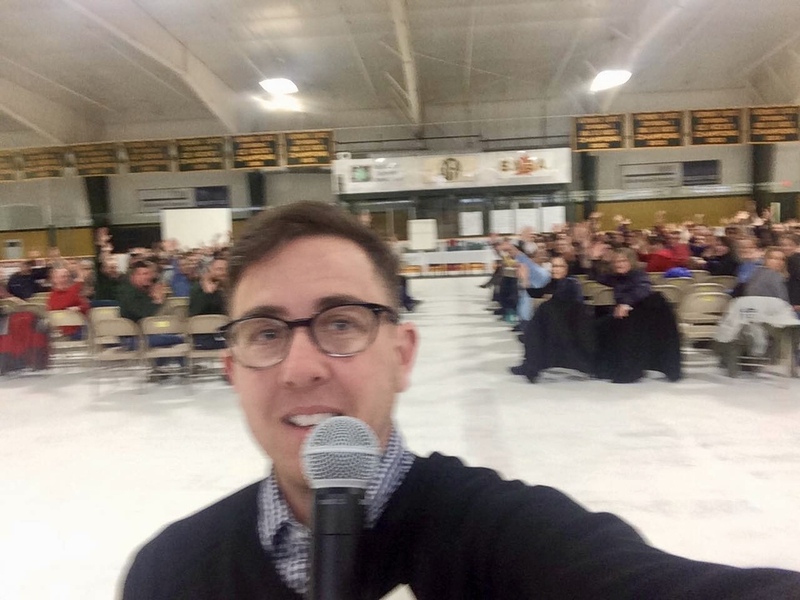 “During a time in our country when many marginalized individuals are feeling vulnerable, we felt the need to reach out to our LGBTQ+ students by working with the adults who spend a great deal of time with them,” said Dr. Sean O’Dell, FCSU’s Curriculum Director. “Having seen the Youth Risk Behavior Survey results confirmed that, even in Vermont, we need to be purposeful in creating a welcoming community for all of our children,” said O’Dell. Dr. O’Dell, along with the Supervisory Union’s Sexual Health Education group and its Diversity Committee, partnered with Outright Vermont, whose mission is to “build safe, healthy, and supportive environments for gay, lesbian, bisexual, transgender, queer, and questioning youth ages 13-22.” Dana Kaplan, Outright’s Director of Education, helped design the gathering in March, which included a keynote by Kaplan and a panel of seven students from the BFA St. Albans GLOW group (Gay Lesbian Or Whatever). Kaplan spoke about how difficult it can be for adults to understand gender and sexuality the way we understand it today. “We grew up in a time of male/female and gay/straight dichotomies, but today we understand gender and sexuality as spectrums,” said O’Dell. The youth panelists provided very concrete examples of things adults can do to make school a positive and caring place for students at all points on these spectrums. Surveyed after the training, ninety-seven percent of respondents reported feeling that the Outright Vermont and the student panelists were effective in achieving their goal. One attendee remarked that it was great to hear from the students because it helps to see youth we know and love bringing their experiences to light. According to Keith Franchetti, a Speech-Language Pathologist in the Supervisory Union, "it made me proud to work in a setting that takes seriously the goal of creating a safe and nurturing environment for all of its members, students, faculty, and staff. THAT is the message that came through to me loud and clear today: We took a whole morning, as an entire group, to learn and share information, experience, and skills that will make a minority feel welcomed, appreciated, and safe. THAT is an unmistakable signal that we are not just paying lip service to the idea of being inclusive and accepting. We really mean it. And from the top down." The work begun by the Franklin Central Supervisory Union at the March gathering joins the work the SU began with the Anti Defamation League last school year and will continue in the new Maple Run Unified School District in the future. As of this year, all schools in FCSU/MRUSD now have Gay Straight Alliances (GSA’s) that provide an inclusive place for youth to learn, advocate, and socialize; the MRUSD Board has asked Dana Kaplan to do a presentation for them so that they can become better informed about the needs of our LGBTQA+ students; and MRUSD is beginning to train teachers in the Out for Safe Schools project, which aims to provide educators with concrete ways to intervene when they see or hear non-inclusive behavior. “We take the social-emotional needs of all of our students very seriously, and this is just one of several efforts we are making to be the most inclusive school community possible,” said Dr. Kevin Dirth, Superintendent of Schools.